If you own a building that has a flat roof, or a shed that needs a roofing upgrade, you may be interested in learning how to install roll roofing. If you've never heard of roll roofing, you may be surprised to discover that it's not only one of the easiest types of roofs to install, it's also one of the more cost effective means of installing a new roof. While learning how to install roll roofing certainly has its advantages, it doesn't come without its challenges. If the roof is not laid properly, there may be some waterproofing issues that may arise. 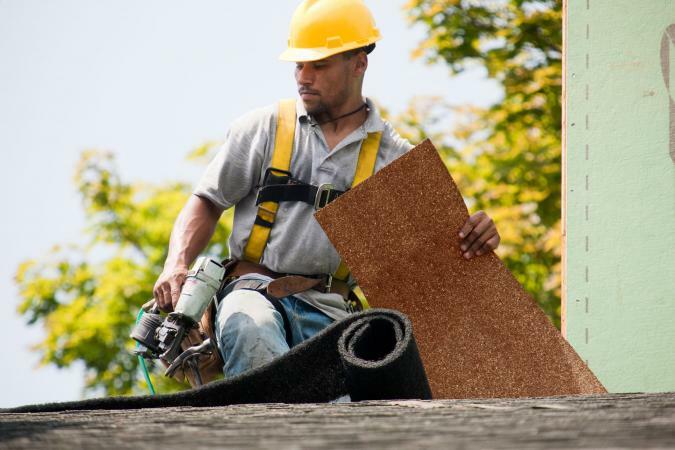 Roll roofing material is also not commonly recommended for use on a home's sloped roof, but certain types can be used on steep or low-sloping roofs as long as the roof is installed by a professional who knows how to handle the challenges of doing so. Additionally, whereas a traditional shingled roof is comprised of three layers, roll roofing has only one layer. Roll roofing is pretty plain looking as well, which makes it a more practical choice for roofing a shed or a part of your house that's not visible from the curb. It's not really recommended for use if you're looking to completely renovate your home's appearance. When installing roll roofing, the material provides an all-in-one roofing solution so an underlayment is not necessary, although almost every professional roofer will recommend one be laid prior to installing the roll roofing for added protection. By installing an underlayment, you'll extend the life of your rolled roofing material. Before you begin installing the rolled roof, lay the sheets out flat and straight to avoid puckering or curling after installation. To make this easier to do, cut the rolls into several sheets sized between 12 and 18 feet long. Once cut, stack the sheets on top of each other to speed the flattening process and help dry the sheets out slightly. It can take up to an hour for the sheets to become flat enough to work with. Cut a strip of roll roofing approximately 18-inches wide (this is going to be your starter strip). Apply about a three inch layer of roofing cement along the eaves of your roof where you are going to begin your installation. Set the starter strip over the cement so it hangs over the eaves by a half-inch and use a roofer's roller to flatten it down. Nail the starter strip in place by driving galvanized roofing nails every three inches along the seam and edge. Use roofing cement (about a two-inch layer) to cover all nail seams and edges and cut away the excess overhang with a utility knife so the new roofing edge is lined up with the underlayment. Use a chalk line and snap a straight line set two inches down from the top of the starter strip. Cover the area above the chalk line with roofing cement and use the chalk line as a guide to where to lay the next sheet of roofing. Nail the section down and lap cement every nail. Once both sides of the roof are covered with the roll roofing material, cut a 12-inch wide length of roll roofing to cover the hips and ridges on the roof. Nail down the ridge seat and apply lap cement to finish and seal. Follow these tips to make sure your new roof goes down smoothly. Clean the roof area of any sticks or small stones as over time they may poke holes through the roll roofing material. It is also advised to install a drip edge along the roof's edge. On high-pitched roofs, install the roll roofing vertically; lower sloped roofs allow for an easier horizontal installation. It's not recommended to install roll roofing when the temperature is below 45 degrees Fahrenheit.